Announcing the winners of the 38th ever Right Place Photo Caption Contest! Presenting the top 15 captions for this picture from REUTERS/Larry Downing via Yahoo! "Psst... would you two 'Froot-Loops' knock it off?" #14: "I can't believe I ate the WHOLE thing." #13: Senator McCain begins to feel queasy as ethanol fumes mysteriously fill the room. #12: Kennedy: "Mine's the big Oldsmobile with the back seat full of Hooters carry-out boxes. There's a shiny new quarter in it for you if you bring it round for me, quick-like." #11: "No, the blonde in the third row. Do you think she can swim?" #9: "You're right, Ted! If you look into his ear you can see straight through to the other side!" #8: "Be ready to run, young Obama. The RINO is a slow but unpredictable beast and may charge if it discovers that the cameras are not on." #7: MOAB: Mother Of All Belches. #6: McCain makes the mistake of listening to his own rhetoric and is overcome by nausea. 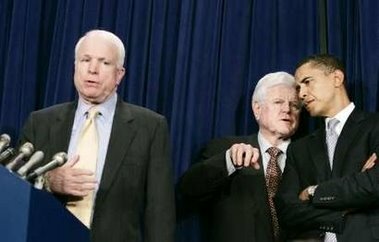 #5: Senator McCain, sensing Ted Kennedy's presence, moves to protect his wallet. #4: Ted: (whispering) "His mind is too developed for this subtle Jedi mind-trick, but on his bowels, it does wonders." #3: "You see, Obama, when I turn the invisible knob this way, McCain leans to left. Now keep it a secret." #2: "I can't believe I swallowed all of those Democratic talking points. You guys haven't got any Pepto, have you?" #1: "I warned him that anyone who's ahead of Hillary in the polls should hire a food taster, but did he listen? N-o-o-o-o-o-o!" Now available for immediate theft: Custom blogger buttons with a regularly-updated standings post hyperlink! For the code you need to post either icon on your own blog, just click on it and scroll down near the bottom of that post! Buttons designed by the magnificent and all-powerful Hoodlumman of File It Under...!